Accepting their vital role within their own communities LifeLine Nehemiah Junior Secondary School (JSS) pupils were involved in a community sensitization campaign against teenage pregnancy and early age sexual activity. 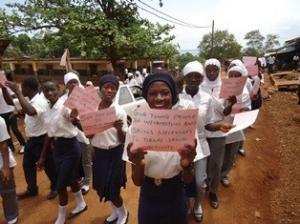 The campaign involved a parade through the community, with our JSS pupils carrying placards. The campaign and march were organised by Save The Children.